The MA_BBands.ex4 indicator is a modified version of the Bollinger bands indicator, which features an enhancement of the middle band line, which is actually a 20-period moving average. The MA_BBands.ex4 indicator will be used in a strategy which identifies price extremes. In order to do this, the original indicator will be modified as shown in the chart setup below. MetaTrader4 Indicators: MA_BBands.ex4 indicator (adjust the standard deviation setting which comes with the indicator from 0.2 to 2.0). 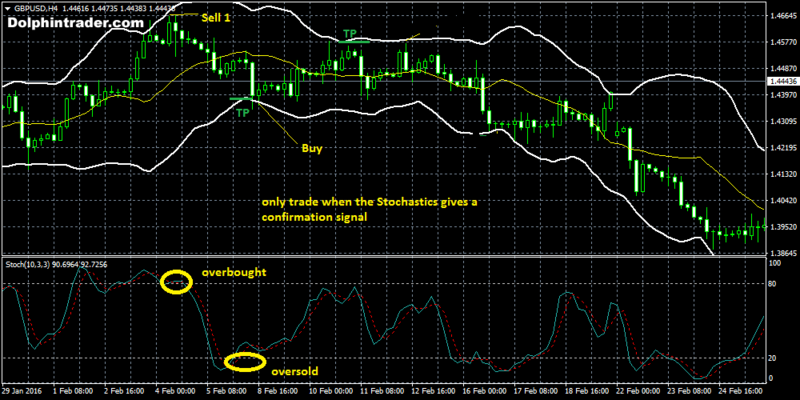 The second indicator is the Stochastics oscillator set to 10,3,3. Preferred Time Frame(s): 15 Minutes, 1-Hour, 4 hours. The upper and lower bands will be used as areas of support and resistance, and the signal is confirmed by the use of the Stochastics oscillator which provides overbought and oversold signals. The price action candle touches the lower MA Bollinger band with the Stochastics oscillator showing an oversold signal (lines cross at <20). Enter long at the open of the next candle. Place the SL at a few pips below the low price of the candle which first touches the lower MA Bollinger band. The Take Profit is set at the upper MA Bollinger band. However, allow the price action to cross the middle Bollinger band by about 20 pips and then apply a trailing stop to follow the price action all the way to the upper MA Bollinger band. Allow the price action candle to touch the upper MA Bollinger band. The Stochastics oscillator must also show an overbought signal (lines cross at >20). Enter short at the open of the next candle. Set the stop loss to a few pips above the upper MA Bollinger band. The Take Profit is set at the lower MA Bollinger band. However, when price crosses the middle band, you can apply a trailing stop to follow the price action to its logical conclusion. The MA_BBands.ex4 indicator presents a different way to trade price extremes. By adjusting the standard deviation between the upper and lower bands, it is possible to capture the range of price action which can then be used to trade long or short. It is essential to confirm the signals by using an indicator which shows when the currency pair is oversold or overbought, and this can be achieved with the Stochastics oscillator.